So this bring us to the end of the Mummy movies in this franchise. There is an appearance of the Book the Dead in the 2017 Dark Universe The Mummy but that's all folks. The Dark Universe seemingly killed off an new movie in the Mummy part of this franchise. But with the less than stellar results of that movie and the new Scorpion King movie last year. Let's not say never. I still have the Mummy Chronicles books to go but I'm still awaiting them to arrive and I'll review them as they come in. 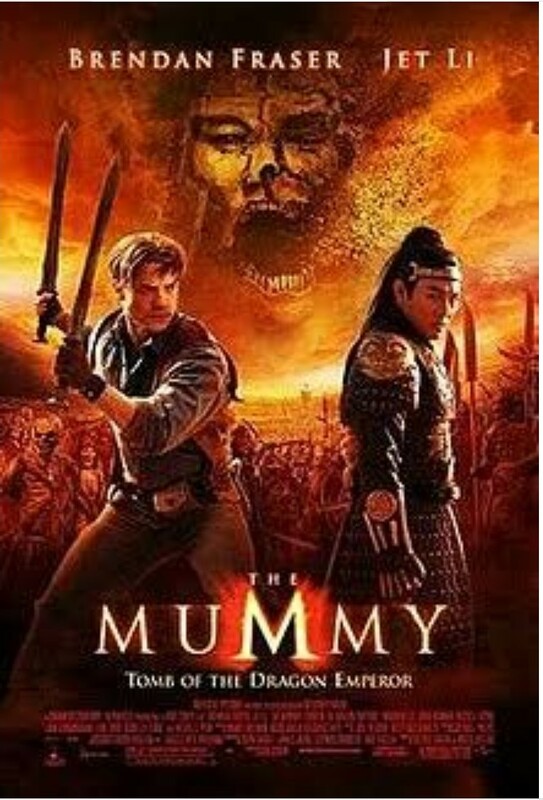 So the third movie in the series has a lot in common with the fourth Indiana Jones film which came out the same year. Both take the series in a new direction, both are set after WWII and hint that the main characters have had an extensive career in espionage during the war. Of the two I think I like the Mummy more. Set in 1947, Rick and Evie (now played by Maria Bello) have retired after World War Two and are bored out of their minds. So they leap at the chance for one last job delivering an artefact to China, Jonathan has a night club in Shanghai. Wouldn't you know it but Alex (Luke Ford) has dropped out of college and has discovered the Tomb of the Dragon Emperor. Due to magic, the Emperor and his army have been turned into terracotta soldiers and they are awakened. It's another fun romp of a movie, Bello is fine as Evie, I like Luke Ford as Alex, there is a tension between him and Rick that plays out in this film (and sperates it from Indy which has a similar plot with Indy and his son Mutt). Alex is so similar to his father and he chafes being in his father's shadow (and to a degree his mother). This movie opens up the scope of the franchise, even setting up the sequel. Taking the movie to China with another all powerful undead villain (something the Animated series did to a degree while still relying on Im Ho Tep to an extent. The movie travels to Shangri La and the O'Connells encounter Yeti and fight a dragon. The Dragon Emperor shows us that the O'Connells don't need Im Ho Tep to battle. If you like the first two check out this one.